Network Speed Monitor is a simple and easy-to-use application to display your current network speed in menu bar, including the downloading and uploading data. When your computer connects to the network, you can see your current network speed with Network Speed Monitor. 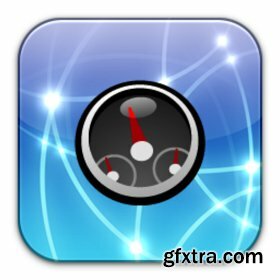 Network Speed Monitor is a handy application for you to monitor and record your income and outcome data and keep you alert about whatever is running in your computer. • Put the menu item in the leftmost place on the menu bar so that other menu items will not fluctuate. • Automatically show the speed between Mbps and Kbps. • Click and choose to change the refresh interval from 1 second to 10 seconds. • Opt to switch from Bits per second to Bytes per second. • Check your real network speed to know whether it reaches to the speed which the network operators promise. • Know whether there are some hidden applications are running to slow down your network than normal. • Keep a track of your internet bandwidth usage so that you will know whether your internet stream go beyond the limit. • Instead of having the up and downlink speeds side by side, you can select to put them one on top of the other. • Instead of just one color, you can have the download as green and upload red. • Add an up arrow and down arrow next to the numbers so you know which one is upstream and which downstream. You need select the menu item "show the up and down arrow" first. • Add a menu option to choose between mbit/s, kbit/s and auto. • Add a menu item to reset the "Data Received/Data Sent" Stats.